Next Moto Z4 Play Might Come With a 48MP Rear Camera and WaterDrop Notch. The Mobile World Congress 2019 is going to be great as flagships from many smartphone manufacturers will land at the event. Nokia 9 PureView is one of the most anticipated smartphones which we expect to get showcased at the event by HMD Global. 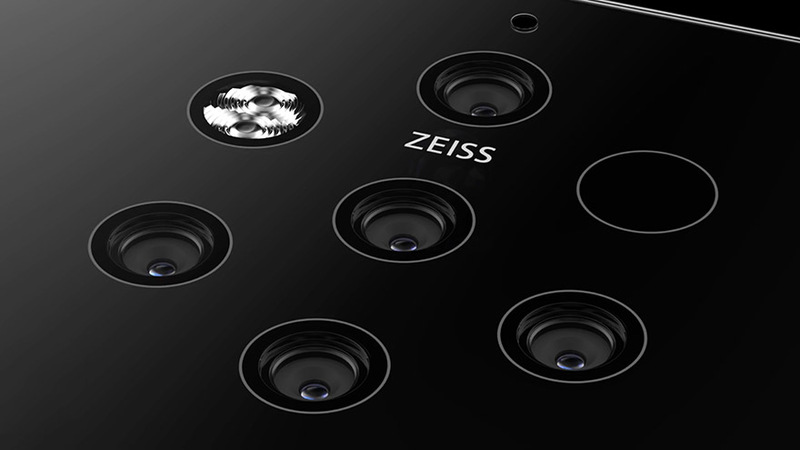 But now the smartphone’s press renders have already been leaked online with it’s details. 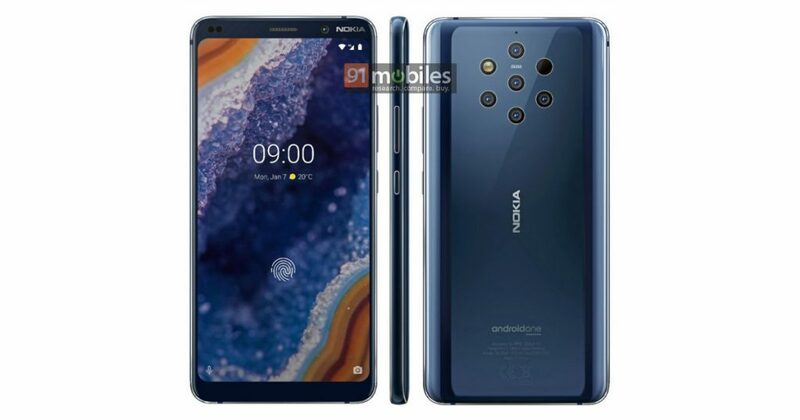 The Nokia 9 PureView smartphone has been in the leaks numerous times but a legit press render for the device has now been shared by @91Mobiles and it looks great. 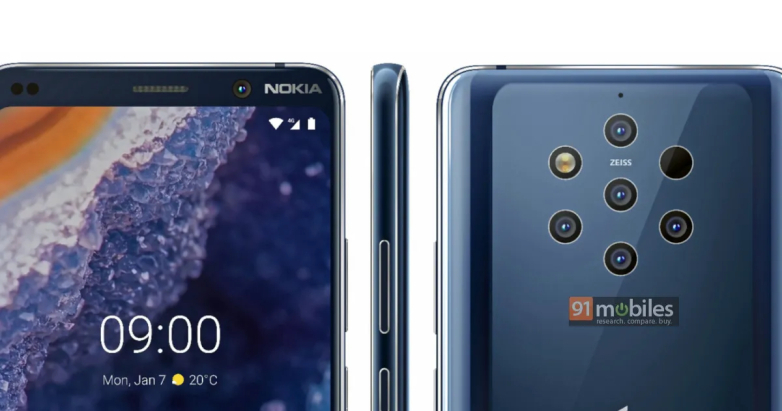 The press renders for the Nokia 9 PureView suggests a 5.99-inch QHD+ display but with a boring design. At the era where most of the smartphone makers are cutting the bezels and introducing notch or some sort of technology to make the display look beautiful, this Nokia’s device sports traditional bezels. It sports thick bezels at top and bottom but still manages to look good. But this might not be interesting for some however some people do hate the notch displays and want a simple look. The smartphone sports an In-display fingerprint scanner which is first for the company and good news for Nokia fans. Whatever it is about the front look, the rear look is what makes this smartphone unique and a head-turner at MWC event. It sports a Zeiss Penta-lens camera setup at the rear with LED flash. Other than this, the press renders doesn’tt reveal much about the specifications but some of it’s detail were already out. So let’s quickly checkout them. The device is said to get powered by an Qualcomm Snapdragon 845 SoC which is last years chipset but it is also said the the phone may power more powerful Snapdragon 855. It will come with 8GB of RAM and probably 128GB of internal storage. It is also said that the device will be 5G compatible which is interesting. Also Read: Moto Z4 Play Might Come With a 48MP Rear Camera and WaterDrop Notch. Stay Tuned for more updates on Nokia 9 PureView and also Subscribe to Our YouTube Channel Gadget Gig For Latest News, Reviews, Unboxing and Tips/Tricks.